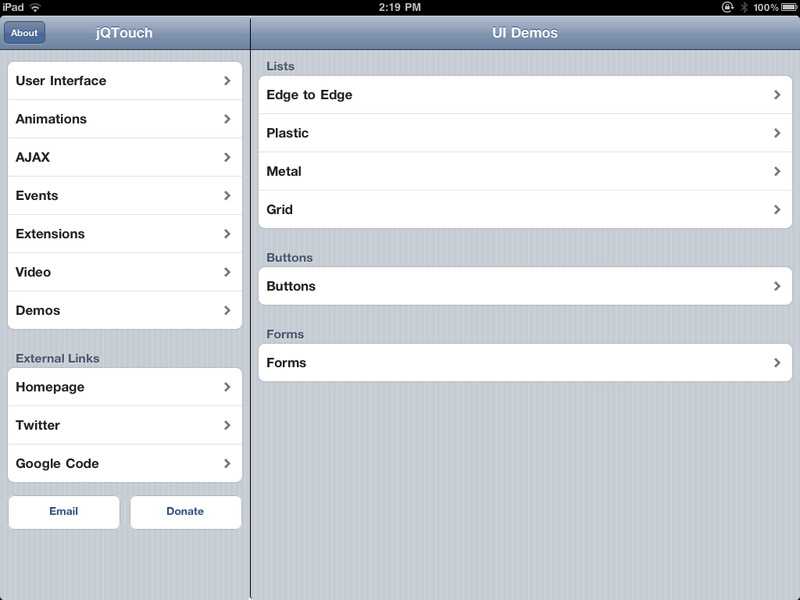 jQTouch on iPad with minimal modifications. Right, time for a slightly more nerdy post. As I was looking for a simple way to make my jQTouch webapp iPad ready without having to resort to a fork (like Beedesk’s). I found the following solution that I’d like to share with you lot. The sollution is pretty simple, and is *unobtrusive*; it will not affect the iPhone/iPod layout and functionality (as far as I can tell). // Thanks to Andrew Hedges! Note 2: Make sure this div is somewhere *after* your home-div in the HTML. This will add the class ‘current’ to my home div (‘#home’) and place it ‘out of reach’ for the jqtouch animations: it will always stay in view. Now refresh your webapp and it should run normally on iPhone/iPod and should switch to a 2-column layout on the iPad. Animations will still work! EDIT: Yes, there were some closing brackets missing from the CSS (as I copied it from Beedesk’s fork, it seems the brackets are missing there, too). Fixed it now. Im trying to get the toolbar across the hole width, not splitting it up. But I cant get it to work. This is what I got working now. Any input appreciated. good points. Note that the ‘jqt’ id is new in JQTouch since a few releases ago. I recommend you update to the latest version, you can find it on Github. OK, I’ve got it working, so for dummies like me, here is what I had to tweak. 1. In point 1, there are two missing } at the end of each of the media only sections you will have to add. 2. In point 2, you will only need to include one of the two methods listed. I started off including the whole block but only needed the first of the two ways. 4. In point 4, if your code doesn’t have a div id=’jqt’ statement, you will have to add one right at the top, and a closing div right at the bottom. Not all example code you find has this div pairing and mine didn’t. Hope this helps retain a bit more hair. Sorry – none of the code came out in the previous post – rats. Trying again without the brackets. I can see the normal overzicht html page showing quite correctly in the right half of the screen, but there is nothing at all on the left hand side of the screen – just black – regardless of the code I put in the ‘home’ div. Hi. Thanks for your work here. I am having trouble getting it to work. I just want to check step 4. I didn’t previously have in my code, so I’ve added one right at the top, and a corresponding closing div right at the bottom. Additional: The slide left and slide right are also applied to the aside column. Fade and flip animations are ok. Any idea how to solve for slide animation ? Nice work, but the whole page animates. The aside column should stay fixed on screen. Any ideas how ?